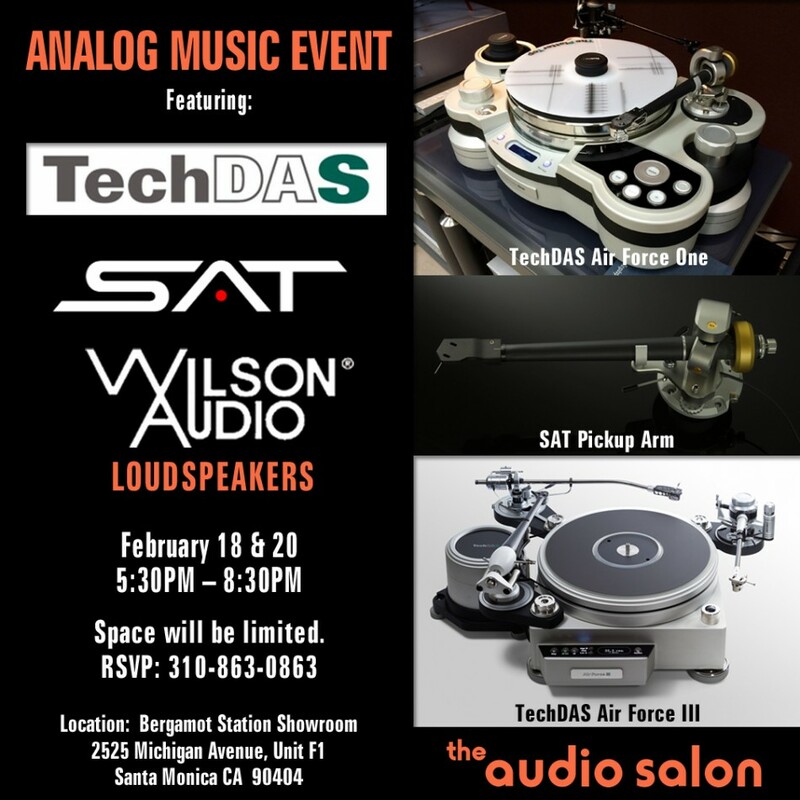 The Audio Salon will be hosting Mr. Hideaki Nishikawa, the designer of TechDAS, Bob Graham, TechDAS U.S. distributor along with Marc Gomez, designer of the SAT Pickup Arm, for an incredible two evenings of analog listening enjoyment on Thursday, February 18th and Saturday, the 20th, from 5:30 to 8:30pm. We’ll be conducting listening demos on both the TechDAS Airforce One turntable and their newest Air Force III turntable, mounted with the SAT Pickup Arm and Graham Engineering Phantom Elite tonearm, with Lyra Atlas and TechDAS TDC01 Ti cartridges. Technical discussions about the engineering behind each of the featured products will be presented by the designers. Mr. Nishikawa will be demoing from an exclusive selection of his personal vinyl collection. The latest Constellation Audio electronics will supply the Wilson Audio Alexia loudspeakers. To attend this event, please R.S.V.P. to 310-863-0863.